RANCHO SANTA FE — The Helen Woodward Animal Center is readying for its legendary 12th annual Surf Dog Surf-A-Thon. On Sept. 10, Del Mar’s Dog Beach will be an incredible sight to see with canines riding the waves. Jessica Gercke, public relations and communications director for the Helen Woodward Animal Center, shared that this event is one of the most fun things that they host. According to Gercke, there is a reason why the Surf-A-Thon takes place after Labor Day: The leash laws at dog beach are lifted. Activities for the kids are free, and plenty of vendors and food will be on hand. The surfing festivities kick off at 8 a.m. and end at 1:30 p.m. Competition portals are broken down into canine weight classes. For pet parents who want to see if their dogs can “hang eight” and could be contenders for the Surf-A-Thon, Gercke shared that lessons begin in mid-July and people can reserve their Saturday spot time. Gercke said that surf dog lessons started a few years ago with the help of So Cal Surf Dogs. They were already surfers themselves, and their dogs would hop on board with them. 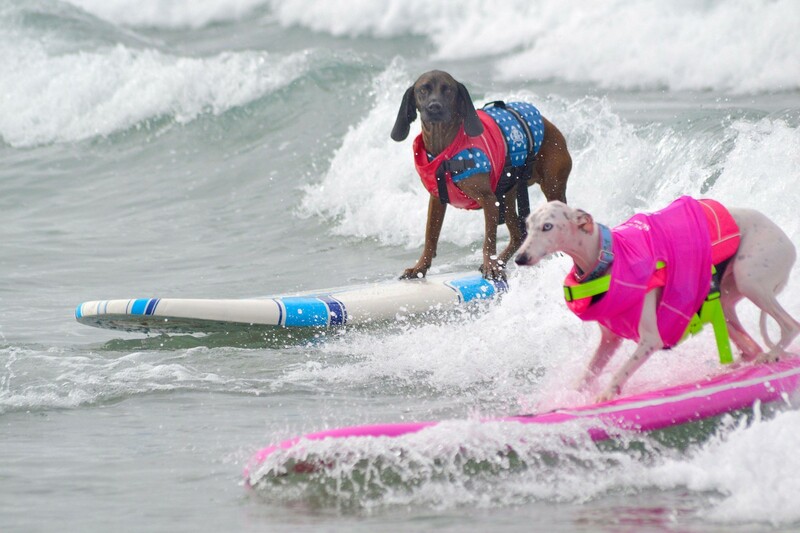 From there, the competitions emerged, and many of the dogs have been nominated into the Animal Center’s Surf Dog Hall of Fame. Gercke also pointed out that So Cal Surf Dogs instructors are attuned to whether a dog is enjoying the moment. The classes are an excellent way to test a dog’s penchant for surfing. Everything is provided at the lessons, including doggie life vests. Classes do not exceed 10 pets and Rob Kuty, the official pet trainer at Helen Woodward Animal Center, is out there with his staff along with So Cal Surf Dogs. There’s lots of trainer attention during the classes. For dogs that aren’t into surfing, owners and their pets can try a stand-up paddleboard. It’s an option for dogs that like the board but may not want to be in the waves. Since the inception of Surf Dog Surf-A-Thon, Gercke said similar surf events have sprung up all over the world. Helen Woodward Animal Center is excited to know that it all started in San Diego — and theirs is a nonprofit where all the monies raised goes toward its pets and programs. For more information about the event including dog surfing lessons, visit https://animalcenter.org/surf-dog-surf-a-thon.